Whatever its possessors may say to the contrary, the North American doctor of philosophy degree is not so much about scholarly attainment as it is about power: sheer, naked, inexorable economic and social power. Originally intended as the certificate attesting specialized preparation for research in the major scholarly disciplines, it has proliferated in an unchecked fashion throughout our intellectual world, becoming the mandatory qualification for teaching in higher education, employment in research, and advisory work in business and government. Without the Ph.D. degree, one cannot now hope to be permanently retained as an instructor at most of the thousands of institutions of higher learning on this continent, even in the teaching of junior undergraduates. Without the Ph.D. degree, one cannot now hope to become involved with formal research in most fields at any level higher than that of technician or research assistant. And without the graduate school that grants the Ph.D. degree, a university itself must accept a lower ranking in the hierarchy of institutions, with a diminished academic reputation and a reduced income from government and private funding. Social prestige, financial security and institutional pride have all combined to make this single piece of paper a professional requirement more formidable than anything in history since the rule of the mandarins in Imperial China. And those same social, economic and academic factors have also combined to conceal from society at large the sad truth that, like the certification procedures of the Imperial mandarinate, the Ph.D. program has become inflexible, cumbersome, restrictive and deplorably wasteful. As it presently functions in most disciplines, it has become a trap for the candidate and a sinkhole for intellectual resources. Nowhere is this more evident than in the bittersweet story of the delayed academic triumph of Frank Bourgin, who must hold the world record for longevity of a successful doctoral program. When that story first appeared on the front page of the 22 April, 1988 edition of The New York Times, it attracted many readers with the simple poignancy of its title: "After 45 Years, Vindication for Scholar." A candidate in political science at the University of Chicago, Bourgin labored on a lengthy dissertation from 1940 through to 1942, challenging the established assumption that the American founding fathers structured the government of their new republic to function economically in accordance with the widely influential "laissez-faire" doctrines of Adam Smith. Proceeding initially from Jefferson's policy statements in office, then on into the public planning proposals of Alexander Hamilton and others, he argued that the framers of the American constitution were in fact projectors of what he named "affirmative government": a strong and interventionist federal presence, intent upon using the financial and political resources of the nation for the public good, much in the manner ultimately attempted by Franklin Delano Roosevelt with the "New Deal" programs. "I shall never forget the inner excitement of discovery," he later wrote, recounting the events in a privately-circulated essay: "and feeling that I was making an important contribution to better understanding our history, and correcting previous errors of interpretation." Lamentably, this scholarly exhilaration was doomed to be frayed and dissipated over decades of increasing frustration. Bourgin's supervisor retired, and the monumental dissertation "in effect became an orphan." In March of 1945, while involved in the most recent of a succession of wartime duties, Bourgin was advised by the department that further work on the dissertation "was necessary to obtain acceptance." The department's advisory notice also contained something of an ultimatum: Bourgin must quit his wartime job and return to the university full-time, in order to make the required revisions. Speculating on this response over four decades later, he concluded it stemmed from the department's anxiety that his work was "too controversial, too new, too different, too unorthodox to be accepted." But the exigencies of his service dictated that Bourgin could not comply with the university's conditions, even had he been so inclined. This impasse meant forfeiting years of intense research effort; worse still, it meant abandoning all hope for the academic career that had commenced so brightly before the war with several years of college teaching. "I was stunned," Bourgin confessed, "and for a time shattered." Like many others before and since under similar circumstances, he packed his dissertation away and eventually drifted into a series of other pursuits. "It took years for me to get over the pain and suffering," he recalled, "since, in the eyes of the world and to a degree in my own, I was a failure and I felt it. "1 But he never forgot that intricately-argued book, which he carried about with him year after year in a black steel file box, a solemn testament to achievement deferred that remained sealed shut until 1985. Near the middle of the Reagan-Bush era, deep in what some have called "the decade of greed," with politicians everywhere citing the American founding fathers as the first proponents of governmental disengagement from economic affairs, Bourgin wrote a brief summary of his own thesis in rebuttal, which was published shortly thereafter. Two years later, after reading a similar line of analysis in Arthur Schlesinger Jr.'s latest book, he sent a copy of his summary to the distinguished historian. To his credit, Schlesinger not only replied positively, but immediately set in train a process of re-examining the dissertation at the University of Chicago, subsequently involving himself in finding a publisher for the work. The only surviving member of Bourgin's original committee soon testified that he had never seen the study during the war years, effusively praising it as "a massive scholarly production, organized around a significant theme with findings powerfully supported by data," one that conceivably "has also corrected some important historical errors. "2 On the grounds that the original committee had not had the opportunity to assess the project properly, the University of Chicago convened another committee to finish the job: and Dr. Frank Bourgin, on Friday, June 10, 1988, conveyed to convocation in a wheelchair at age 77, was granted his degree almost half a century after he had begun his thesis research. Strikingly atypical though Dr. Bourgin's experience might seem to some, especially those advocating the academic status quo, in at least one important respect it has proved far more than symbolically representative. Over the decades of his lonely quest for scholarly recognition, the average span of time consumed in successful completion of the doctorate has relentlessly lengthened throughout the entire westernized world. A definitive American report on the duration of doctoral programs has done much to establish that fact conclusively. Based on 29,991 responses to a survey of the 32,278 persons earning doctorates at American universities during 1987, a statistical sample reaching an unprecedented 93% of the target group, the Summary Report 1987: Doctoral Recipients from United States Universities demonstrates that "the time spent in completing a doctoral degree in the United States has been rising steadily for nearly 20 years." Placing the data of their survey within the context of results obtained from earlier studies, the National Research Council investigators maintained that "the increase in time-to-degree should be an issue for all those interested in doctorate 'production'. "5 Central to their analysis is the concept of "Median Age at Doctorate," defined as the age at or before which one-half of the successful candidates in a given field of study received the degree. Ranging from a low of 29 years in Chemistry to a high of 39.8 years in Education,6 these statistics sketch out a profile of an increasingly aging intellectual elite, a cadre of experts just beginning their professional careers when many of their most productive days have already elapsed. Remember, the "Median Age at Doctorate" is necessarily also an age beyond which the other half of the successful candidates in a given field had already lived! Dr. Bourgin's adventure is thus far less of an anomaly than most educators would care to believe. Unmistakably delineated in the NRC analysis is a statistical profile we will encounter repeatedly in various configurations throughout this book: the numbers, in this instance years of "time lapse" in graduate study from completing the baccalaureate to earning the doctorate, are "clearly field-related." To gauge this time lapse, the NRC used two different measures: registered time-to-degree (RTD), counting only the years a recipient was actively enroled at graduate school, a net span; and total time-to-degree (TTD), counting all the years a recipient spent between completing the baccalaureate and earning the doctorate, a gross span. Overall, "by either dimension, time-to-degree has increased approximately 30 percent over the last 20 years." Significant though this might be, it is the variation between broad fields of study that truly astonishes. In the physical sciences, an RTD of 5.1 and a TTD of 6.0 years in 1967 had increased to an RTD of 6.0 and a TTD of 7.4 years by 1987. In the social sciences, an RTD of 5.2 and a TTD of 7.7 years in 1967 had swollen to an RTD of 7.2 and a TTD of 10.3 years by 1987. And in the humanities, an RTD of 5.5 and a TTD of 9.4 years in 1967 had ballooned to an RTD of 8.4 and a TTD of 12.0 years by 1987. As the subject moves from the physical sciences through the social sciences and thence to the humanities, from the more objective to the more subjective disciplines, the span of time expended both in school and off campus lengthens significantly. By 1987, although the program was demanding years more from everyone, many candidates in the humanities were devoting roughly half again as much time to the acquisition of a doctorate as a candidate in the physical sciences. Those statistics initially hit home to the academic community with considerable force. "University administrators agree the trend is troubling," the 15 March, 1989 issue of The Chronicle of Higher Education reported. "The lengthening time to a doctoral degree, they say, can deter undergraduates from considering doctoral study, can demoralize those already enroled in graduate school, and represents an inefficient use of campus resources. "7 Such admissions were far too little, far too late, and far too ineffectual for reform-minded thinkers, many of them scientists impatient with a tradition-ridden structure consuming years in elaborate exercises. The 29 March, 1989 issue of The Chronicle of Higher Education went on to delineate one of the more radical proposals, the elimination of the time-devouring final research dissertation that constitutes the cornerstone of the existing program. Arguing that "doctorates in some fields should be awarded on the basis of published journal articles, rather than one massive work on a single topic," the reformers contended that "changes in disciplines, particularly in the sciences, are forcing reconsideration of the traditional dissertation. "8 Nevertheless, any such development was bound to encounter resistance from humanists who "still follow the old Germanic magnum opus format;"9 and most commentators gloomily conceded that the debate would go nowhere as objections and counter-arguments proliferated. The status quo would prevail, simply because there was yet again not sufficient general consensus for major modifications. This flourish of scholarly legerdemain is representative of the establishment faculty defense of the establishment graduate schools. By quibbling over the validity of the NRC findings, Bowen and Rudenstine might deflect attention away from the full gravity of what has evolved in our westernized higher education, redirecting analysis into endless hair-splitting over arcane abstract manipulations of existing data. And their own contribution to those arguments, offered throughout the book and summarized remorselessly in Appendix D, "Reinterpretation of the Evidence," is something of a doozy. The reader's eyes glaze, the reader's mind numbs, as page after page of theoretical assumptions illustrated by graphs, tables and calculus-style equations fuzz and blur while elaborating the contention that "the case for concluding that TTD has risen dramatically" is "a serious error. "14 However, what on earth is actually accomplished here? The point itself is of minimal relevance, since (no matter how computed) the problem of lengthy program duration does indisputably exist and anyhow remains an issue of considerable concern. And rather than mathematical showmanship, as Appendix D finally concedes, we just need more comprehensive statistics: "there are no national data on [all-encompassing] completion rates, because such data can be collected only if determined efforts are made to follow the careers of all entrants to a graduate program, including those who drop out. "15 Most tellingly, that had not been done, anywhere in the westernized world at the time the book appeared. And it has only slowly and hesitantly begun since then, a process still retarded by the tendency of academics to fiddle about with figures the entire intellectual community recognizes as inconclusive. Meanwhile, the doctoral program continues to grind inexorably along, still much as traditionally structured, because we have again been reassured by respected experts that alarmist doctoral statistics could be in "serious error." For the record, then, let it be noted that the NRC investigators have quite properly disregarded this sort of qualifying objection. As Bowen and Rudenstine themselves admitted, the Doctorate Records File of the NRC constitutes "a remarkable database" proving "a veritable treasure-trove" of information on those successfully completing doctorates over the past seven decades in the United States.16 Following the publication of In Pursuit of the PhD, the NRC statisticians did indulge in some minor tweakings of their data: nevertheless, as the Summary Report 1995: Doctoral Recipients from United States Universities demonstrates, the results from the program have not improved over the better part of a decade. If anything, they have become marginally worse, with attainment times in the physical sciences and social sciences displaying a distressing tendency to increase towards the completely unacceptable levels of those in the humanities. In the physical sciences, the RTD of 6.0 and the TTD of 7.4 years in 1987 had climbed again to an RTD of 6.9 and a TTD of 8.4 years by 1995. In the social sciences, the RTD of 7.2 and the TTD of 10.3 years in 1987 had inched ahead to an RTD of 7.5 and a TTD of 10.5 years by 1995. And in the humanities, the RTD of 8.4 and the TTD of 12.0 years in 1987 remained stalled at those depressing levels by 1995.17 Here, it is worth remarking upon developments in education, the one field with the worst total attainment times in the survey. Posting an RTD of 8.2 and a TTD of 19.9 years by 1995, the number of doctorates awarded to educators declined by 2.8 percent since 1985.18 Surely, this might reasonably be deemed a portent for the future, if our universities continue to resist proposals for intelligent reform. As in the United States, little has changed for the better since then. A study entitled Organization and Administration of Graduate Programs, published in 1995 under the direction of Dr. Edward A. Holdaway as principal investigator, conveyed the findings obtained from detailed interviews and questionnaires directed chiefly at senior academic personnel: deans, coordinators of programs, experienced supervisors. While the primary emphasis was on programs in Canada, the study also drew upon responses from institutions elsewhere in the westernized world: the U.S.A., the U.K., Australia and Sweden. And in general, once again, the Canadian respondents "all commonly stated that completion time is often too long." While "considerable variability occurs among departments," one constant stood out dramatically: "the humanities were often identified as having a particular problem." In Australia, "the natural sciences (including biological sciences), engineering, economics and medicine tended to have the shortest time-to-completion." A similar profile prevailed in the United Kingdom, with one respondent rather candidly acknowledging that the Science and Engineering Research Council had been "under pressure to show value for money," adding that the organization "uses [dissertation] submission rates as an indicator of productivity. "24 Pressures of that sort, however, were meeting with some resistance. "One British university," Holdaway and his colleagues noted, "has experienced increasing percentages of students who have to revise substantially after quick submission." Yet talk of "the straight-jacket of time," the usual prefatory rhetoric accompanying legitimate questions about whether or not "faster completion should be forced,"25 cannot bode well for significant institutional reform: if the universities successfully discount time-to-degree as an issue to be meaningfully addressed, the programs will continue on much as before, ensnaring candidates in their exercises until well into middle age. This is a process that can only get worse. The Holdaway study suggests another alarming trend: the tendency for graduate studies at the mastership level to stretch out, which can only further extend the already torturous path to the doctorate. In the estimation of the Canadian graduate coordinators, a mastership in science could take somewhere between 1.71 to 4.03 years, with a mean at 2.53 years. In arts, the corresponding figures are somewhere between 1.54 and 4.17 years, with a mean of 2.45 years. And in the fine arts, the corresponding figures are somewhere between 2.25 and 4.39 years, with a mean of 3.05 years.26 Such a prolongation of the preliminary graduate program can help explain the profile of increasing age among candidates for the senior degree. In 1992-93, according to data from Statistics Canada, there were 3,401 full-time Canadian doctoral students enroled in the humanities, 4,360 in the social sciences, and 9,129 in the natural sciences and engineering. Their ages ranged from under 24 to over 50 in all three areas of study: however, the distribution varied considerably, depending on the discipline. In the humanities, the elderly dominated: only 3% were under 24; 31% were between 25 and 29; another 28% were between 30 and 34; 16% were between 35 and 39; 10% were between 40 and 44; 6% were between 45 and 50; and a surprising 4% were actually in their second half-century. In the social sciences, the statistics followed a similar pattern; but in the natural sciences and engineering, the younger were more prevalent. There, 5% were under 24; 44% were between 25 and 29; 32% were between 30 and 34; 13% were between 35 and 39; only 4% were between 40 and 44, and a mere 1% were older than 45.27 It is important, however, to reflect that these are the ages of people enroled that academic year only: there is no indication of how many more years each of these individuals had to consign to a completion of the degree. Truly, even in the sciences and engineering, let alone the other disciplines, the senior degree stands in peril of becoming another certification of the senior citizen. The insufficiency of these unfortunate developments can be rendered even more stark by comparison with other professional qualifications administered and awarded through the universities. The degrees of doctor of medicine, bachelor of laws, bachelor of architecture and bachelor of engineering are conferred upon practitioners entrusted with some of the gravest responsibilities of our place and time. The care and healing of the sick, the regulation of justice, the sound and tasteful design of buildings, and the safe, economical and practical construction of systems providing transportation, water supply, industrial production and waste disposal: these are objectives easily as consequential to society as the instruction of university students or the apprenticeship to scholarly research. Nonetheless, candidates pursuing the academic requirements for these endeavors attain their certification far faster and far more effectively than their contemporaries seeking the Ph.D. Although national regulations governing the licensing of these professionals can vary from jurisdiction to jurisdiction, and very often in disconcerting ways, those recently pertaining in the Canadian province of Ontario are still reasonably typical of contemporary westernized life. And there, in 1994-95, it took a duly qualified freshman student four years of preliminary medical instruction and one to three years of specialized postgraduate residency training in one of 61 certification programs to proceed with the practice of medicine. Similarly, it took such a candidate three years of university preparation, three years of law instruction, one month of practice skills session, one year of articling and three more months of instruction to gain admission to the legal bar. Again, it took such a candidate five years of university instruction, three years of work experience and two sets of professional practice exams to be registered with the Canadian Architectural Certification Board. And it took such a candidate four years of university instruction and satisfaction of engineering accreditation requirements to be registered with the Association of Professional Engineers. In short, a period of somewhere between six and eight years after high school would suffice to produce a practicing doctor, lawyer, architect or engineer.28 Why could it not also suffice to produce a practicing professor or research specialist? In theory, it could. According to calendar specifications at most of our universities, it would take a duly qualified freshman student four years to complete a baccalaureate with honors, a year or two thereafter to earn a mastership in the field of specialization, and two or three years after that to get a doctorate. Seven to eight years, perhaps a little more, in theory. But harsh reality, as the OECD researchers and others have pointed out, is quite another matter. The university calendars tend to minimize the awkward implications of the fact that only the bachelor's phase of this process is fixed in terms of course stipulations and time necessary for completion. Unlike the requirements for the M.D., the LL.B., the B.Arch., or the B.Eng., which compel completion in accordance with stated courses and time frames, the requirements for each of the graduate degrees are extremely flexible and range widely. They shift about from country to country, jurisdiction to jurisdiction, institution to institution, department to department, and even candidate to candidate. In truth, what one candidate must do to obtain either the mastership or doctorate in any field at any university will always be substantially different from what another candidate in the same department and program must do to obtain the same degree during the same time. That is because each candidate must work under a different supervisory committee, and nobody has either the expertise or the authority to coordinate what all those different committees are doing. The outcome is an administrative chaos that often generates frustrations, delays and career-destroying obstacles. The tenured professoriate, of course, is understandably reluctant to contemplate the disquieting realities implicit in the numbers. As a result, in nation after nation, the tenured professoriate strains collectively to place the responsibility for every infelicity upon some other party. The scapegoats, inevitably, are either governments or the students themselves: governments, for underfunding the universities, which (it should be noted) spend the largest single percentage of their budgets on professorial salaries; and students, for lacking motivation or money, resources essential (it should also be noted) either to comply with professorial dictates or to augment professorial stipends. Bowen and Rudenstine effectively undercut such rationalizations, however, with their own sets of data. Their study is concentrated upon the most qualified students with the highest levels of scholarship support at the most distinguished and generously-endowed graduate schools: Berkeley, Columbia, Harvard, Princeton, Yale, Chicago, Cornell, Stanford, Michigan, North Carolina. And yet, even with these well-funded and carefully selected students working under the best-paid and most prominent academic professionals, there is no significant change from what was occurring elsewhere. In the six illustrative programs selected, English, History, Political Science, Economics, Physics and Mathematics, no heartening deviations could be cited from the depressing norm of other American graduate schools. "Completion rates have been surprisingly low (given the quality of the students chosen and the financial support provided)," Bowen and Rudenstine glumly remarked, "and it has taken nearly as long for the recipients to complete their degrees as it has taken other graduate students. "29 Obviously, then, it is reasonable to look elsewhere than the students and their funding for factors causing those unacceptable results. Yes, but don't count on it. Faculty resistance to a considered reappraisal of institutional factors responsible for unproductive graduate programs should never be underestimated. Homer C. Rose, assistant dean for graduate studies at the University of Michigan, offered some thoroughly typical professorial sentiments while commenting on the 1987 NRC findings in the 15 March, 1989 edition of The Chronicle of Higher Education. "It's really not a bad life," he breezily declared, speculating that candidates have deliberately been prolonging their studies across the past two decades because job prospects were weak. "You're kind of poor, but you still interact with the faculty and your peers, and it's better than the prospect of being locked out of academia entirely or having a one-year appointment at Rattlesnake Junior College. "30 Job prospects had not been weak for much of the period surveyed by the NRC, but tenured professors are adept at disregarding inconvenient history. Rather than confront the facts of their own performance, most specifically the sorry track record of their own teaching accomplishments, those snug in the haven of tenure much prefer to float hypotheses in the style of Dean Rose: middle-aged graduate students chose to linger in academic servitude, scrounging for research or teaching assistantships, piling up ever-increasing debt, and mindlessly squandering their most active years, all simply because they are enjoying themselves. The analysis has about the same intellectual substance as that offered by the fishmonger's wife in Boswell's Life of Johnson, replying to the gentleman protesting the cruelty of skinning eels alive. "Don't fret yourself about it, sir, they're used to it." More and more frequently, therefore, observers outside academe are becoming intolerant of flimsy evasions along such lines. The CMA Committee expressed widespread discontent as they brusquely swept aside the canon of professorial apologia. "Many excuses are advanced to explain this [situation]," they snorted: "but we have seen few, if any, of these excuses which stand the test of rational examination. "31 Confronted with challenges as direct as these, some academics are now grudgingly beginning to admit that, yes indeed, perhaps certain institutional factors might be involved. Hedged round with vagueness and evasion though those concessions inevitably are, they still mark progress of a sort. After their annual meeting in 1988, when the Canadian graduate school deans stressed the "excessive and increasing time" spent in graduate study, they began by urging the same threadbare faculty remedies of increased funding and more stringent student regulations. Faculty members should "lobby to strengthen internal fellowship, scholarship, loan and bursary programs, and inform and require students and supervisors to apply for all available external awards," University Affairs reported, without remarking on the irony that all such activities would seem to fall under the authority of the graduate deans themselves. And faculty members should further "make present regulations concerning deadlines, programs and procedures known to every student, supervisor and academic unit at appropriate intervals," again a responsibility that would seem to fall under the authority of the deans. But last on the list, couched in the most cautious language, the deans also exhorted faculty members to "tailor degree demands to the length of time during which a fellowship-quality student can reasonably be expected to finish before the fellowship runs out. "32 Bingo! Here, the deans are no longer dodging their duty: here, albeit with the greatest circumspection (and, let it be added, with the greatest of trepidation) they are beginning to address the core difficulty. In academia, this is progress. Progress of a sort. Yet given such glacial faculty movement, governments and other funding agencies are contemplating and even implementing far more draconian measures to push at the pace. In England, where doctoral candidates in the social sciences were most deeply mired in the procedural slough, the Economic and Social Research Council took the unprecedented step of blacklisting fourteen institutions from receiving doctoral research scholarships for 1986 and 1987. "Between them, the fourteen received over 120 Ph.D. studentships in 1979 and 1980 and include some of the main social science research training centres," the 1 November, 1985 edition of The Times Higher Education Supplement announced: "University College London and Liverpool University, for example, both had recorded over twenty Ph.D. starts in those two years, but have so far  recorded only one [dissertation] submission apiece. "33 The ESRC action was extended to other institutions in subsequent years, and additional punitive tactics were employed by the Conservative government to link funding with academic performance. Despite "howls of protest from academics," steps like these have undeniably "produced dramatic results," argues the 25 December, 1993/ 7 January, 1994 edition of The Economist. "Thanks to a vigorous use of penalties against departments with low submission rates, for instance, the proportion of British PhD students completing their theses within four years has soared...."34 Public approbation along these lines will continue to dominate public policy. Notwithstanding faculty fears and denunciations of the direction of such supposedly indiscriminate reforms, all universities throughout the westernized world had better pay attention. Beyond any question, either the institutions will competently reform themselves, or have reform of some description anyhow imposed on them. To guide the inevitable process of reform, interested parties would be well advised to begin with the history of the program. In sharp contrast to the degrees in medicine and law, which trace their development directly back through the intellectual traditions of Europe to the founding of the great medieval universities, the doctor of philosophy degree is very much an intellectual Johnny-come-lately. While it also has antecedents in the European traditions, its development to its modern form is essentially an American phenomenon, deriving much of its strength and appeal from elements characteristic of educational movements in the United States over the past two centuries. Associated at its origin with the sweep of scientific technology across this vast continent, the degree soon became linked with the more attractive values of American culture: vitality, ingenuity, practicality and broadness of scope. To grasp this point is to realize something of how the degree escaped sustained critical scrutiny for so long. In essence, scholars, institutions and society at large all accepted it as it seemed to be, rather than as it was. And truly, the disappointment of the doctorate is not that it set out to embody those positive American values, but that it ultimately failed to do so. Whereas the promise of the doctorate is interwoven with its American origin, the reasons for its failure to achieve that promise are far more universal. First in the United States, then in Canada, and finally in England and even on the European continent and elsewhere, the degree encountered the same obstacles to its full and proper realization. Despite its original designation and continuing service as a research qualification, individual and institutional vanities have united to make it the mandatory teaching certificate for university undergraduate instruction, thereby annually attracting into the program thousands of people with interests other than research. Worse still, as a singular instance of academic circularity, the need to prepare doctoral candidates for undergraduate instruction has resulted in encumbering the program with features incompatible with research. And worst of all, the comparative success of the program in the sciences has led to the adoption of the program in all the other major disciplines, most of which lack the methodological resources to realize its potential. The combination of these factors over a century of rapid academic expansion in the westernized world has pushed the doctorate towards inefficiency, inequity and inflexibility, at the very time it has attained paramountcy as the indispensable academic distinction. Viewed from this perspective, though, the current difficulties with the program hardly appear unresolvable. Unable to refute or dismiss the constantly increasing body of evidence that doctoral training is needlessly complex, ineffectual and unproductive, the universities may finally elect to move with the impetus for reform, rather than be directed by it. Part of the process should focus on the various professional and personal vested interests that threaten to inhibit satisfactory reform. Another part of the process should focus on the ever-heightening fascination with scholarly methodology throughout the academic community, which must continue to raise questions concerning the suitability of the doctorate to research in many disciplines. And still another part of the process should focus on the as-yet unexamined premise that the doctorate provides the best preparation for undergraduate teaching, a doubtful premise considering the teaching attainments of those thus prepared so far. Out of the ensuing analysis and debate, a consensus could emerge on the most desirable modifications to the system, and the universities will enter one more phase of their continuing evolution. It has all happened so many times before. The message of this study, which might otherwise be taken as critical and negative, is actually in summation both constructive and positive. 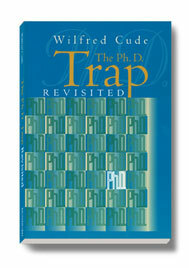 Our primary intellectual institutions sorely require a revitalizing overhaul, particularly in the humanities and social sciences: the necessity is accentuated by analyzing attrition from the doctorate, by sketching the almost Byzantine history of the doctorate, by describing the manifold academic pressures retarding development of the doctorate, and by outlining the various traditions influencing the doctorate. But the program itself not only can and will change, it has already begun to do so: the point is made by citing existing alternatives to the existing structure, and by delineating some of the factors hastening a recourse to those alternatives. This book is a plea for an intensive scrutiny of all the relevant considerations, that we might strive together to turn what is coming into a better thing. In seeking the spiritual exhilaration that creative innovation alone can instil, we conduct ourselves so that our posterity might regard us with the same respect we rightly accord the finest of our forebears. And scholarship can furnish no more fitting reward. 1 Frank P. Bourgin, "12 Page Story," unpublished typescript prepared for family, friends and media, April-May, 1988, pp.3-8. 3 Arthur Schlesinger, jr. to Frank P. Bourgin, private letter, 26 April, 1988. 4 Frank P. Bourgin to Wilfred Cude, private letter, 17 May, 1988. 5 Susan L. Coyle and Dolores H. Thurgood, Summary Report 1987: Doctoral Recipients From United States Universities (Washington, D.C.: National Academy Press, 1989), p.29. 7 Jean Evangelaue, "Lengthening of Time to Earn a Doctorate Causes Concern," The Chronicle of Higher Education, March 15, 1989, p.A1. 8 Peter Monaghan, "Some Fields Are Reassessing the Value of the Traditional Doctoral Dissertation," The Chronicle of Higher Education, March 29, 1989, p.A1. 10 Howard Tuckman, Susan L. Coyle and Yupen Bae, On Time to the Doctorate: A Study of the Lengthening Time to Completion for Doctorates in Science and Engineering (Washington, D.C.: National Academy Press, 1990), p.5. 12 William G. Bowen and Neil L. Rudenstine, In Pursuit of the PhD (Princeton: Princeton University Press, 1992), p.xv. 17 Peter H. Henderson, Julie E. Clarke and Mary A. Reynolds, Summary Report 1995: Doctorate Recipients from United States Universities (Washington, D.C.: National Academy Press, 1996), p.13. 19 Max Von Zur-Muehlen, "The Ph.D. Dilemma in Canada Revisited," The Canadian Journal of Higher Education (February, 1978), p.79. 20 "Graduate deans unhappy about time taken to finish degrees," University Affairs, March, 1988, p.9. 21 Science & Technology Committee, "University Graduate Training: Is the Pipeline too Long?" Discussion Paper: Canadian Manufacturers Association (Ottawa: Canadian Manufacturers Association, August, 1986), pp.1-2. 22 Graham Winfield et al., The Social Science PhD: The ESRC Inquiry on Submission Rates (London: Economic and Social Research Council, 1987), pp.45-6. 23 OECD Research Staff, Post-Graduate Education in the 1980s (Paris: OECD Publications Service, 1987), p.44. 24 Edward A. Holdaway, Claude Dubois and Ian Winchester, Organization and Administration of Graduate Programs (Edmonton: University of Alberta Department of Educational Policy Studies, 1995), p.10-1. 28 See the relevant calendars for the faculties of medicine, law, architecture and engineering at the University of Toronto, 1994-95. 29 Bowen and Rudenstine, p.196. 31 CMA Science & Technology Committee, p.2. 32 "Graduate deans unhappy about time taken to finish degrees," p.9. 33 "ESRC cracks down on PhD rates," The Times Higher Education Supplement, November 1, 1985, p.1. 34 "Towers of babble," The Economist, December 25, 1993 - January 7, 1994, p.74.